One of the parts of new motherhood I most looked forward to was introducing solids to my daughter. Passing on my love for food, nutrition and awareness of sustainability and the environment is one of the many pieces of parenthood that I view as a gift I can give to Grace. Many of you have asked how I went about introducing solids to Grace: which foods we started with, how we did it, why I chose the way I did. My decisions were based on a mix of research and intuition. Grace has eaten a mostly AIP diet so far – not for restriction purposes but for nutrient density. She has eaten some non-AIP foods like seed spices (most days) and egg yolk (a few times), but we haven’t introduced butter, ghee, nightshades (I never buy them), nuts, seeds, any packaged baby food, other dairy or grains yet. This is what I feel is right for our family, and my only goal in writing this article is not to tell you what I think you should feed baby, but to give a detailed example about how this first time mom went about it! My top recommended resource for learning about the most nutritious foods to feed your baby is Super Nutrition for Babies. 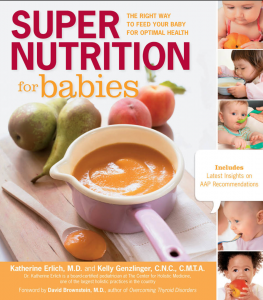 Super Nutrition for Babies closely aligns with the Weston A. Price Foundation focus on high-quality pastured animal foods, vegetables, probiotic rich foods and gut and immune-supporting quality fats. It outlines the best foods for baby at each stage of development from 6 to 18 months, which makes planning so much easier. I followed it fairly closely but deviated with my focus on wild seafood and decision to not include whey (dairy-based) ferments as the book suggests because of my history with cow’s milk intolerance that started at a fairly young age. I also signed up for Megan Garcia’s First Foods online course, which was very helpful about timing of food introduction. It includes some pretty neat charts on the exact nutrient density of certain foods (i.e. which foods are high in iron, zinc, B vitamins, magnesium, etc) that I definitely geeked out on. I suggest identifying your main purpose/why with food introduction. 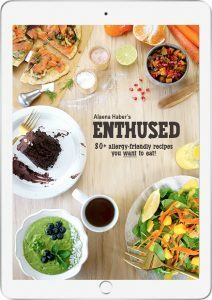 My purpose was to introduce the most nutrient dense, least allergenic foods that my baby at her developmental stage would physically be able to masticate, swallow and digest. I’m first going to discuss why we started with Baby-Led Weaning and transitioned away from it by the time she hit 7 months old. I’ve had that question come up a lot from readers! This is not a case for or against BLW – I just followed Grace’s cues and without influencing her one way or another she let me know which foods she desired at each stage! 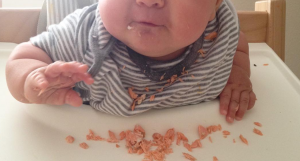 Did we do Baby-Led Weaning? Whether or not a real food mama chooses to do Baby-Led Weaning (BLW) or begins food introduction with purees is typically the first decision in this process. I assumed I would do BLW through and through with Grace because I learned about it in multiple Facebook real food parenthood groups. There were several posts a week advocating for BLW with adorable pictures of little ones sucking on strips of steak, big pieces of broccoli florets, and roasted carrot wedges. 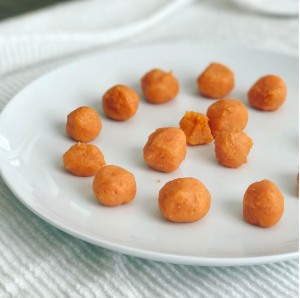 The stated benefits include less picky eaters later in childhood, increased ability to handle variety of food textures without choking, and baby developing fine motor skills more quickly through repetitive self-feeding. Honestly, my baby has demonstrated all of those benefits without doing BLW exclusively, and it is definitely not a requirement if you’re a real food mama. Not a jab at BLW – I am in full support of all mamas educating themselves and making the best decision for their family! Go with your gut on whether or not you want to try BLW, and if you don’t have a strong gut instinct either way, give it a shot after doing some reading. I have learned for myself it’s best to not label my parenthood choices, as our children have different needs each day. Whether that’s our decision to vaccinate or not vaccinate, go back to work or stay at home, or how we choose to discipline our children… staying open-minded and flexible helps us ride the wave of child development. What we choose one day may be the exact opposite what we choose the next day. This perfectly mimics my experience with solid introductions. Grace let me know each day what she was capable of handling, and I wanted to support her needs first. I am passionate about food waste, and so much food was making its way everywhere but her mouth and tray table. I know it wouldn’t be that way forever as she developed her feeding skills, but for a short time purees both fed by myself or self-fed were better on our budget and less waste occurred. For our family, for the best way to ensure Grace was receiving the micronutrients she needs for optimal immune system and gut health, a more controlled puree feeding was ideal. This lasted maybe 6 weeks, which is a drop in the bucket in her entire life. I’m going to bargain that those 6 weeks won’t have a drastic impact on her “pickiness” as she ages. Most important, my mom intuition told me introducing large pieces of food and focusing my efforts on the process of BLW rather than spending my time and energy focusing on optimal nutrition just wasn’t right for us. There’s moms who can do both, but I could only manage preparing the food, and the anxiety of giving my little baby large chunks of food was too much for me. I have had bouts of post-partum anxiety so this was a decision influenced by that. If we have another child, I may feel more comfortable with the process! Grace had a power grasp (a full-fisted grasp) at 6 months but her pincer grasp didn’t emerge until closer to the start of her 8th. This made it difficult for her to self feed certain foods that we were focusing on like liver pate and slippery foods like salmon. I’ve read from multiple high-quality sources that around 6 months of age many breastfed babies need micronutrient supplementation through solids… particularly iron and vitamin D. If a breastfed mother’s diet isn’t also optimal, that baby may be at an increased risk for micronutrient deficiencies. I wanted to make sure Grace was able to consume the foods that would support her immune system and for a short stint, spoon feeding was a helpful vehicle for this. For me it was more intuitive to focus on just one thing: highly nourishing, anti-inflammatory and non-allergenic foods. During this time, I focused on pastured and grass fed animal organs, meats, and fats as well as non-shellfish seafood and root vegetables. Honestly, this is still my focus at 10 months because these are some of the most nutrient dense foods one can eat! They supply her with heme iron, vitamin D, omega 3s like DHA and EPA, zinc, B-vitamins, glucose, fiber and selenium, to name a few. Some studies show that exclusively breastfed babies require a diet focused on iron and vitamin D by 6 to 8 months of age due to decreased stores since birth while other studies state some babies are fine without supplementation until 12 months of age. I suspect it’s on a very individual basis dependent on sunlight exposure, mom’s gestational diet, mom’s current diet, and genetics. Bone Marrow from roasted grass fed beef marrow bones – heaven!! I ate salmon 5x a week when I was pregnant so I’m not surprised she loves it so much! As you can see, she tried maybe 15 foods total by the end of her 7th month, which is fairly average. We minimized the risk of food reactions and it allowed me to more easily determine reactions by only introducing a new food every 3 to 4 days for 60 days. To determine food quantity, I offer small amounts (about 1 tablespoon at a time currently at 10 months) and continue to refill her tray until she signals she is full. I always breastfed her before each meal and waited at least 30 minutes before feeding solids. I wanted to protect my milk supply and ensure she was hungry enough to breastfeed during solid introduction. Morning Meal: I breastfeed her 1 to 1 1/2 hours prior to her morning meal so she has adequate breastmilk nutrition but still has an appetite for solids. This is her smallest meal of the day. She breastfeeds again before her morning nap. Afternoon Meal: I breastfeed her 2 hours prior to her afternoon meal, allow her to digest for 30 minutes, and then breastfeed her after for hydration and nutrition. She also breastfeeds 1 to 2 more times before the next meal. Evening Meal: I breastfeed her 2 hours prior to her evening meal and then breastfeed her two times before she goes to bed after that. Food Quality: She eats better than we do! You’ll also notice that food quality is important to me. I have been sourcing all of our protein and veggies from 3 trusted places: US Wellness Meats, Vital Choice + my local farmer’s market. If I lived closer to a Whole Foods, I would also source some grassfed ground beef or lamb from them. My grocery budget has shifted a bit. I spend more money on the highest quality animal foods I can find and shop at my local farmer’s market for cheaper organic produce. 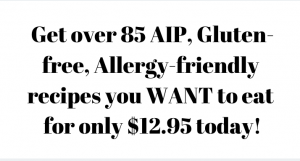 I source all my fats from Thrive Market – I got a membership for Christmas from my mom and I LOVE IT! 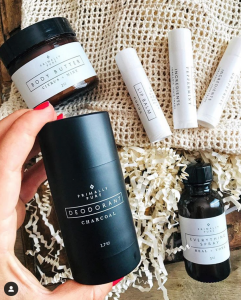 I order from them at least once a month and it saves me SO much time from scouring local health food stores for all my grocery staples! In 4 months, I have saved over $360 by ordering from Thrive! Whether or not early introduction of a food prevents or causes food allergies has been tossed back and forth in the pediatric medical community for years. I based my decision to wait on introducing potentially allergenic foods like nuts, dairy, shellfish, and peanuts on their digestive and nutritional status rather than one scientific study. I see no need to introduce nuts to an infant which is a personal choice not a blanket recommendation for my readers. They can be difficult to digest and can present a choking hazard. I also have not introduced any Paleo flours like almond, coconut or arrowroot which can be difficult to digest and alter the gut microbiome due to their high starch and fiber content (differs between flours). If I weren’t breastfeeding, we would have first sourced donor milk and if that was unsustainable, I would have introduced either the WAPF homemade formula or a purchased goat’s milk formula. I plan to introduce some high-quality grass fed ghee before she is 1 year old since it is casein free. Babies have the lactase enzyme to be able to digest lactose in dairy products, so I wouldn’t be concerned about lactose intolerance at this stage and it tends to be the least allergenic of the dairy products (cow’s milk being one of the most allergenic). Shellfish are super nutrient dense but Grace does very well with salmon, sardines and mackerel, and I see no need to add shellfish which tend to be more allergenic than omega-3 rich fatty fish. Peanuts have a whole host of gut irritating properties, so I will not be introducing those for some time because their ability to damage her gut outweighs their potential prevention of an allergy for me. Egg white protein can be very difficult for an immature gut to digest and is also a top 8 allergen. There’s a reason why it’s a big no-no on the AIP! 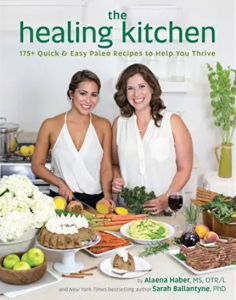 It breaks down the tight junctions between gut cells and leads to leaky gut, according to The Paleo Approach by Dr. Sarah Ballantyne. Egg yolk is where all the nutrition is at so we continue to try those every 6 weeks but I can’t tell if she has a reaction yet. One time they seemed to constipate her and another time they seemed to give her acne around her mouth. Basically, the question I ask myself when introducing a new food to her: “Is this going to provide her easily digestible nutrient-dense material for her immune system and gut health?” Egg whites, nuts/seeds, grains and pasteurized dairy got the “No” from my research and Mom-tuition. They may be the right choice for your family but with my strong familial history of autoimmune disease (it runs rampant on both sides of my family), I’m choosing to go a more conservative route. No more purees needed! Grace graduated from purees by the time she hit 8 months. I still offer them on a spoon to her that she picks up and feeds herself on occasion. Easy to pick up sweet potato fat balls! Very quickly I realized that simply introducing a wide variety of hand-held foods was not going to make her more or less of a ‘picky’ eater. Grace would receive tons of variety over the first year of her life even if part of those foods were pureed or spoon-fed. And her ability to self-feed would naturally develop over the next couple months in a progressive manner. She would tell me when she was ready for larger pieces of intact food. I just had to watch for the signs. And she did. Over the next 2 months, we naturally progressed from pureed liver pate and root vegetables, to mashes, to mashes with soft chunks, to soft chunks which is where we are now with most of her food at 10 months (i.e. pieces of ground beef, fish eggs, pieces of broth-cooked vegetables and ripe fruit). She isn’t picky – she has loved everything she has tried (it took her a few trials of avocado to enjoy it). I have learned to prefers her vegetables to be lightly coated with olive tapenade and I can’t expect her to want vegetables at every meal but she sure wants animal protein every chance she gets! Interestingly, she highly prefers the most nutrient dense foods I put on her table like liverwurst, fish eggs, salmon, bone marrow, sardines and mackarel. She’s also done with mashes and purees on spoons and has no interest in them anymore. 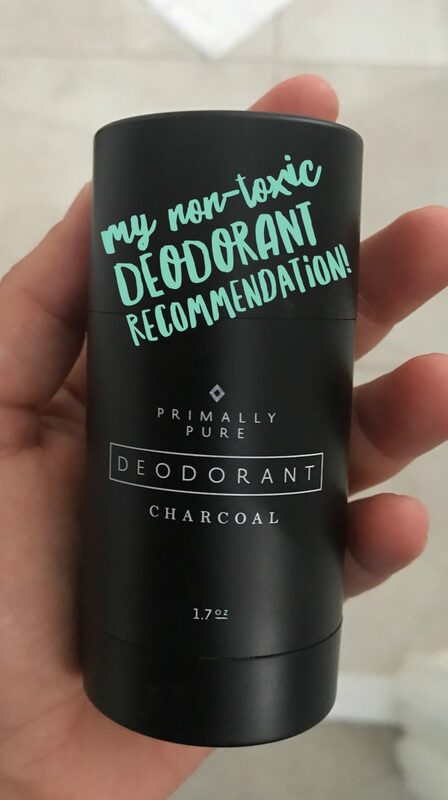 This non-preference developed naturally. I love that she communicated her feeding needs with me, and that I observed closely enough to accommodate them. She still signaled need and satiety with purees and spoon-feeding. As a pediatric therapist, I also fully believe in providing our children with experiences that support their current skill levels rather than challenging them too far outside of their comfort zone. Grace showed me that she much preferred eating pureed and mashed foods between months 6 ½ and 8. And I saw how much she enjoyed grabbing her spoon of liver pate from me and feeding herself. She also showed me signs of wanting me to feed her like making eye contact and opening her mouth once I loaded a spoon. She turned her head away and closed her mouth when she was done. Her body told her brain when she was done and knew when she wanted more. She didn’t need to self-feed 100% of the time to utilize this natural skill. Grace communicates her needs very clearly to me. I have been introducing a new food every 2 to 3 days and sometimes more than 1 new food each day if they are unlikely to be allergenic. She has been eating more foods from my plate than in previous months but the majority of her meals are all “Grace foods” like fish eggs, organ meats, chunks of fruits and vegetables. Servings of “riced” vegetables like my Butternut Rice with Beef and Basil Pesto or my Lamb with Olive Tapenade Rice. These small pieces of vegetables are not digested in her stool, so I don’t offer them often, sticking to more well-cooked veggies. I NEVER give her raw vegetables since she cannot digest them yet. Juice pop made from kale juice, apple juice & cucumber juice. She can eat about 1/4 of it and really loves it when teething! 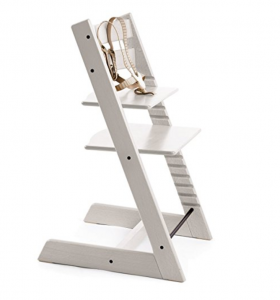 We use the Stokke Baby Tripp Trapp High Chair with the attached baby seat and tray for meals. I decided to go with this higher price point chair because it grows with the child and can be adjusted at several heights. I keep her positioned at a 90 degree flexion at the hips, knees, and ankles which ensures optimal posture for chewing and swallowing food. I do not use any plates or utensils at this point rather I place a small amount of food on her tray and allow her to finish it, wait for her to signal for more, then place more as desired. I easily remove the tray from the seat and wash it with warm, soapy water after every feed and let it dry. To wipe down the chair, I use a warm cloth spritzed with this non-toxic Aunt Fanny’s Cleaning Vinegar which I get on Thrive. I removed the cushioned seats at 9 months of age because they were prone to staining and the extra laundering was becoming a nuisance. She is comfortable without the cushion! We use these IKEA Kids Smocks from Amazon to protect her clothes. They are amazing and my friend Alex from Don’t Eat the Spatula told me about them. There’s a pocket at the bottom to catch any dropped food and they are easy to put on, remove and clean. I wash them in warm, soapy water after every feeding and leave outside to dry between meals. I machine wash them in warm water with vinegar one to two times a week and hang dry. 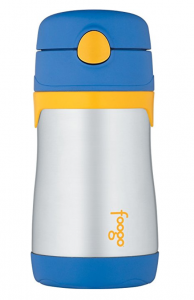 For water, we use this Thermos Stainless Steel Straw Cup. I tested the 360 cup as well as an open cup, but neither of those worked for Grace. She enjoys sipping out of her straw cup when we’re out in the Florida heat and I don’t have any pumped breastmilk available. Sometimes I add frozen pieces of strawberries and mango to her cup to flavor the water. This keeps her water cool for 12 hours! I fill it up all the way and we both sip on it during our walks or jogs. 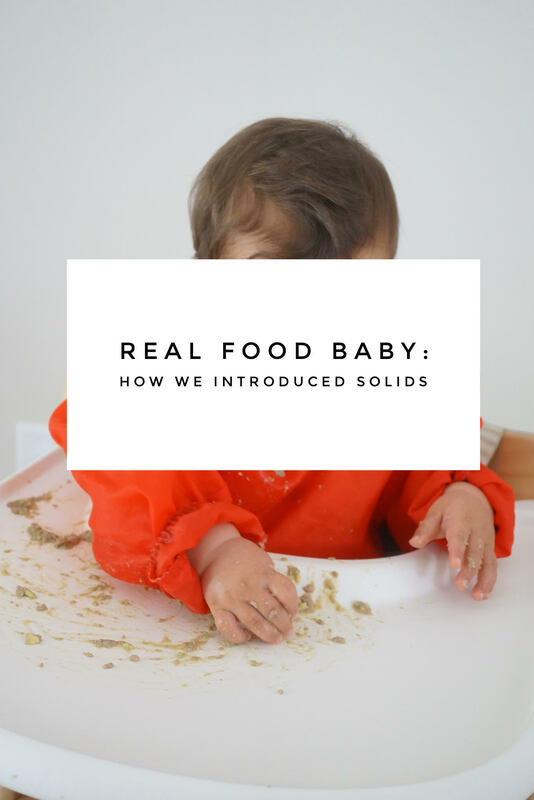 How did you introduce solids? Is there anything you would do differently next time? What are your baby’s favorite foods? Let me know in the comments section! My baby is just shy of a month old, but I SO appreciate this post (and your whole blog, to be honest!). I really connect with a lot of your articles (I am a pediatric SLP, and so I love that you take a developmental perspective), and this one was super informative and helpful to read. Oh, and my daughter was also born with a tongue tie, which made latching/breastfeeding really difficult in the first few days! My midwife was able to revise her anterior tie, but we understood that she may have need further revision for her posterior ties as well. Reading your tongue tie story helped to ease my anxiety in those first days as we were waiting to see if our daughter would need additional revisions. So, thank you for sharing all that you do in such a considerate and articulate way! Hi Carolyn! Thank you for your comment – I love hearing from other OTs, PTs and SLPs in the real food space. I really believe it’s a crucial overlap – I’m sure you’ve noticed in your practice the differences in behavior and skills between kids with particular diets. I’m glad my story has been able to help you and your daughter – that’s so great they were able to catch her TT early too! I LOVE this post! I have Hashimoto’s and a plethora of other Autoimmune conditions on both sides of my daughter’s family – so this post speaks volumes to me. I’m reading the book you suggested (SNFB) and following it pretty closely. We only just started solids yesterday. I was wondering how long you soft boil your eggs and how you extract the yolk? I’ve had to toss two eggs (which I hate waste, and I’ve paid a fortune for these high quality eggs!) because of the white getting into the yolk. I’d love to have your recommendation! Hi there! Glad you’re enjoying Super Nutrition for Babies! Instead of boiling, I instead separate the raw white from the yolk and very gently cook the yolk in coconut oil over low heat on the stovetop. It’s like a baby omelette. Baby can handle a very small sprinkle of sea salt right now too. I have followed AIP and a paleo diet for the past 2 years. I kinda have gone off the rails on and off during and after the end of my pregnancy. I have Hashimoto’s and my husband has juvenile diabetis. So, 2 autoimmune diseases at home to being with. When my baby started solids, I wanted to focus on lo allergen/nutrient dense foods; chicken liver, sweet potatoes, grass fed beef. I also found that the pureed food worked better early on and now that he is 11 months and able to self-feed, we are doing lots of finger food following the same AIP guidelines. I found your insights about food introductions to be so helpful, especially in a world where pediatricians are recommending rice cereal as a first food. I look forward to continuing to read about your parenting journey!! PS: I mix the egg yolk with a tablespoon of breastmilk and it’s like scrambled eggs (funny enough, it smells like melted cheese). Hi May – what a great mama you are! Have fun feeding your little guy all these nourishing foods – it really does pay off! Thanks for this post, so helpful! When you introduced salmon at 6-8 months, did you just get a wild salmon filet from Vital Choice, cook as normal and mash/flake? Do you think canned would be problematic if it doesn’t have salt added? You could use wild canned but I more often than not cooked a fresh or flash frozen piece of salmon for her and flaked it off. Thank you for this post! My babe is 6 months and I’ve been uncomfortable with the BLW. It’s nice to see your approach with the purees AND being able to see Grace’s development and signals. This gives me the confidence to go ahead with some more purees to get my baby the nutrition he needs. We all know exactly what our baby needs (well, they know… and then they tell us haha), we just have to listen. You’re doing a great job! Are the sardines you’re referring to the ones packed in olive oil with salt? Or with no salt or oil? I’m looking to get some for my 9 month old, and I’m not sure if I should worry about the salt or not?